As Christopher Corwin detailed in his review of the Anna Netrebko-helmed iteration of this production, Adriana Lecouvreur is an opera that seems to be most often mounted as an excuse to showcase the sort of one-in-a-million, top-of-their-game, mega-divas of which Adriana is herself one. So I do not envy Jennifer Rowley the task of stepping into Netrebko’s shoes (which a glance at her recent Instagram posts can tell us are in fact gold-chain-laden, thigh-high Moschinos) as the titular thespian, as she must sell the audience not only on the specifics of Adriana’s loves, triumphs, and losses but also on the essential premise that she is the greatest star on the French stage. She also needs, of course, to sound good. Happily, Rowley sounds fabulous: huge-voiced, with ringing high notes and blossoming melodic lines. 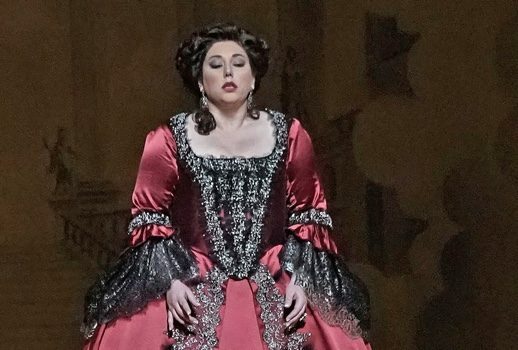 If she is occasionally overpowered by Piotr Bezcala, as her inconstant lover Maurizio, or Anita Rachvelishvili, as her vengeful rival the Princess de Bouillon, it is hard to fault her — this is an evening of very, very big voices. Bezcala’s clear, forceful tenor is never anything less than delicious, and Rachvelishvili’s enormous chest voice pins you into your seat like a strong wind or a cartoon anvil. Sharing a stage with those two, just keeping up at all would be a hard-won success, and, vocally, Rowley is up to the challenge. However, despite having a voice worth getting cocky about, Rowley never quite musters the confidence necessary to be believable as a grand diva. She has an unfortunate tendency to tip her head a little too far backwards or hunch her shoulders a little too far forwards to really lock eyes with the audience, and the tacky wigs and tackier costumes, whose fabric palette can really only be described as “Gone With the Wind but the curtains in Tara all came out of a 90’s housing bubble McMansion,” wore her more than she wore them. Against the blazing fury of Rachvelishvili’s Princess and the campy fluttering of every secondary character, Rowley’s Adriana just seems like a nice girl with a great voice. Sure, she’s a star, but more of an ingenue than a diva. While this reading of Adriana is compellingly vulnerable, particularly in her last-act eulogies for lost love and happiness, it ultimately undersells one of the most interesting components of the opera, its bizarre dynamics of natural vs. artificial. Adriana is an actress, and when she is reciting, she speaks. She is also a character in an opera, so when she is “speaking”, she sings. The result is that in Adriana Lecouvreur, speech is positioned as artificial and singing, even of the highly mannered style found in Cilea’s verging-on-kitschy score, is somehow naturalistic. This is a strange thesis, and it must be presented with a fair amount of confidence for the audience not to notice how counterintuitive it is. For Rowley, potentially effective moments in which Adriana’s spoken recitations give way to sung emotion — the pivotal scene, for example, of Adriana’s triumph, where she fiercely delivers a monologue from Phèdre in order to implicate her adulterous rival — are undercut by how visibly she is summoning both volume and gravitas. Rowley’s vulnerability, which might have made her more believable or naturalistic, actually works against her, undermining what should be a moment of rock-solid performative excess. If you are worried, however, that there was a shortage of metatheatrical excess on the Met stage Wednesday night, you can put your mind at rest; David McVicar’s production is one of those stage-within-a-stage ordeals that only serves to make the enormous Met stage feel cramped and crowded. One of the worst sins of the production design, worse even than the front and center bust of Moliere that is given a baffling amateur Buster Keaton routine, is that the clunky revolving proscenium onstage has uncovered footlight bulbs that are actually painful to stare at for all of Act One, and make reading the supertitles terribly difficult through the after-image glare. Worse still is the troupe of actors ascending the onstage proscenium to mime their bows as Adriana dies. It’s like, wow, did you know she was an actor? Me neither! Subtle the Met’s Adriana Lecouvreur is not. But it’s hardly a subtle opera. It’s a fun opera, full of plot twists and ridiculous grandstanding, mistaken identities resolved and secret identities revealed. In a way, it’s opera at its most “operatic”, and, Rowley’s less than superstar stage presence notwithstanding, the Met has found singing to match.